Full length native protein (purified) corresponding to Hamster Hsc70. Our Abpromise guarantee covers the use of ab19136 in the following tested applications. WB Use a concentration of 0.1 - 1 µg/ml. Predicted molecular weight: 73 kDa. 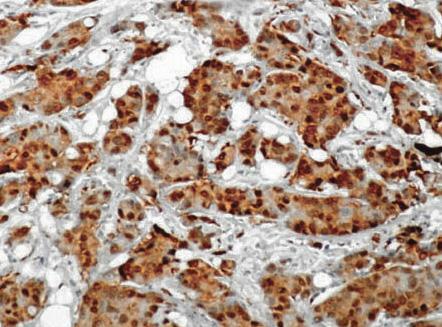 ab19136 staining Hsc70 in Human breast tissue sections by Immunohistochemistry (IHC-P - paraformaldehyde-fixed, paraffin-embedded sections). Tissue was fixed with paraformaldehyde and blocked with 10% serum for 1 hour at 20°C; antigen retrieval was by heat mediation with a citrate buffer (pH6). Samples were incubated with primary antibody (1/150) for 12 hours at 4°C. A Biotin-conjugated Goat anti-rat polyclonal (1/200) was used as the secondary antibody. 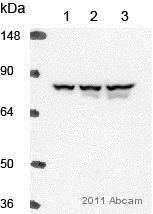 Western blot - Anti-Hsc70 antibody [1B5] (ab19136)This image is courtesy of an anonymous abreview. Blocking: 5% milk for 1 hour at 22°C. ab19136 at 1/150 dilution staining human HeLa cells by ICC/IF. The cells were heat shocked (2 hours at 42.5°C) and paraformaldehyde fixed prior to incubation with the antibody for 1 hour at 37°C. 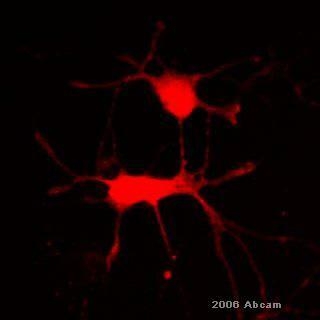 An Alexa-Fluor ® 568 conjugated goat anti-rat antibody was used as the secondary. The cells were also stained with DAPI to visualize the nuclei. Overlay histogram showing HeLa cells stained with ab19136 (red line). The cells were fixed with 80% methanol (5 min) and then permeabilized with 0.1% PBS-Tween for 20 min. The cells were then incubated in 1x PBS / 10% normal goat serum / 0.3M glycine to block non-specific protein-protein interactions followed by the antibody (ab19136, 1µg/1x106 cells) for 30 min at 22ºC. The secondary antibody used was DyLight® 488 goat anti-rat IgG (H+L) (ab98386) at 1/500 dilution for 30 min at 22ºC. 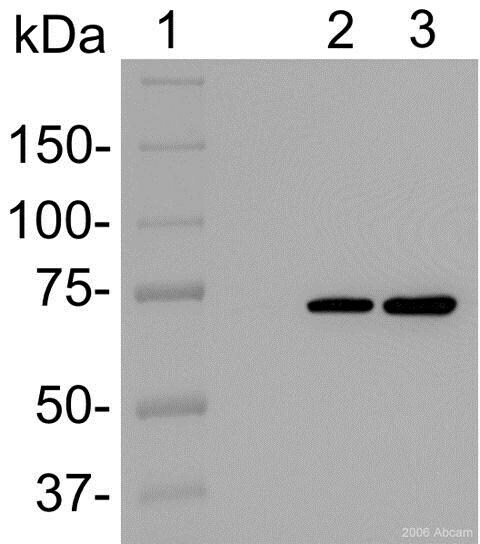 Isotype control antibody (black line) was rat IgG2a [aRTK2758] (ab18450, 2µg/1x106 cells) used under the same conditions. Acquisition of >5,000 events was performed. Publishing research using ab19136? Please let us know so that we can cite the reference in this datasheet. I am thinking of investigating the cell surface HSC70 expression level in some of cell lines by FACS analysis. Does The FACS data that I can see on the web show that Jurkat cells is expressing HSC70 on the cell surface? I just want to know whether Anti-Hsc70 antibody [1B5] (ab19136) and Anti-Hsc70 antibody [1B5] (DyLight® 488) (ab115647) can recognize the HSC70 expressing on the cell surface, as well as cytoplasmic HSC70. I am wondering if it is possible to give me some information about it. Cytoplasm. Melanosome. Nucleus › nucleolus. Note: Localized in cytoplasmic mRNP granules containing untranslated mRNAs. Translocates rapidly from the cytoplasm to the nuclei, and especially to the nucleoli, upon heat shock. The protein is not expressed on the cell surface and cells would need to be permeabilized in order to see staining. LAMP2b (cat # ab18529) and HSC70 (ab19136). However, before purchasing them, we would like to make sure that they work and recognize the proteins in our cellular system (mouse primary fibroblasts and hepatocytes). Our concern is the MW of LAMP2b (45kDa observed vs 100kDa predicted size of glycosylated (stable) protein) and the unusual subcellular localization of HSC70 (by the IF shown on the website, it seems nuclear in one of the figures, whereas it is all over the cell in one of the reviews). For these reasons we would be very grateful to you if we could get a free trial sample of the two antibodies, in order to determine if they are suitable for our purposes. We will test them (we have LAMP2 KO lysates) and submit a review of each of the antibodies as soon as possible. We do not offer free or trial sizes of our products simply because we carry over 100,000 items and having multiple sizes would be logistically impossible with our automated freezers. We would guarantee ab19136 to work in mouse cell staining by ICC/IF in accordance to our Abpromise, so if you had difficulty with this antibody we would replace or refund it within 6 months. But for ab18529, to our knowledge this antibody has not been tested in mouse. However by participating in our AbTrial program you can now use our products in an untested application or species without financial risk. 1. Reply to this email, letting us know you are interested in ab18529 in mouse.